Homeopathy has proven treatment for various viral infections. Based on this established fact, Dr Shah has been working on the treatment of Hepatitis C since last ten years. The treatment has shown promising results. Reducing the viral count and activity by stimulating the immune system. Treating the after effects of tissue changes due to Hep C virus. been able to do well without the conventional Antiretroviral treatment, which is not only very expensive but also have terrible adverse effects. Dr Shah has his patient base in 127 countries. All of the patients are asked to undergo blood tests which involve Liver Function Test, Hepatitis C viral load (count), Hepatitis C virus genotype (optional). After 4 months of Dr Shah's treatment, the patients are suggested to repeat the blood parameters to appreciate the changes. Most patients show a reduction in viral load in 4 months time. The treatment is required to be continued for over 18 months or longer. Hepatitis C treatment is made available online to patients all over the world using the internet or telephone. 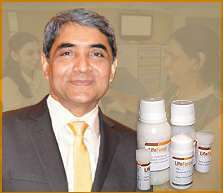 We have patients receiving treatment at Life Force, under the care of Dr Rajesh Shah, from over 127 countries. Please click here to get more information and start treatment.